So, you just finished your half or full marathon. This next phase is critical to complete before you start another training cycle for fall. First rule of thumb is you need 1-day recovery for each mile run in the race. Obviously 13 for a half and 26 for a full. The reason why is quite simple; you have damaged the muscle fibers in your legs. You may not feel it but its there at the cell level, its deep tissue damage. These fibers have to repair themselves and this takes time and care. Recovery doesn’t mean no running. It means take a few days off, eat well, re-hydrate and rest. But you can run. This is the time to really listen to your body and do feeling based jogging or running. Take it slow and easy, your body tells you what you can do. In looking back at my training logs, I noticed the day after the marathon I did no running, took a walk only. Then for the next 5 days simply jogged how I felt each day. It was not only a physical rest and repair but a mental one as well. This continued for 3 weeks while I recharged, by week 4 I was feeling good again and mentally ready to start another cycle. While I was disciplined in terms of running most days, I also felt confident taking a day completely off if I didn’t feel recovery progress was being made. And do not underestimate the importance of mental recovery, taking a break from training is actually training. Morning Heart Rate: It will be elevated most likely for a few days, monitor it and note when it returns to normal resting rate. Weight: Watch for weight loss of 1 pound or more. If you are losing weight while recovering it says your recovery will take longer. Sleep: Keep track of your hours of sleep. During early phases of recovery, it can be less than normal. When it returns to normal you are recovering. We also find that Oofos sandals are helpful. The foam they are made of absorbs daily impact well and they have a good supportive arch area. The sandals literally cradle’s your foot and aids in recovery for those tired and sore muscles. We have a good selection at Running Niche. Please join our Lydiard Method informational session on Thursday April 25 to learn about our next training cycle for fall races. For a full marathon and for some runners a half marathon, a fueling strategy is necessary. Your carbohydrate/glycogen stores are limited and can handle an endurance event of 2 hours or less. But over that at some point soon thereafter in the race you will need to refuel or augment what you have remaining in your body. A study published in the International Journal of Sport Nutrition and Exercise Nutrition took a look at marathon runners using a science based versus random gel strategy during the Copenhagen Marathon. The study found that roughly 3 gels per hour of exercise worked well and provides about 60 grams of carbs/glycose per hour. Here is a picture of the nutrition facts for several gel providers. Look for the total carbs each gel provides. Given the warm weather on Sunday April 7 for GO! races, look for the amount of sodium/salt contained. Obviously, you are going to have to replace more salt than normal on Sunday due to the warmth so higher sodium content is important. Also please remember to drink water when you take your gel as that will allow faster absorption of the gel into your system. So, the final thought here is taking 2-3 gels per hour, lean towards those with higher sodium content and take with water. Since you have enough carbs/glycogen on board naturally to get through the first hour in great shape start “gelling” about one-hour in. Oh, and be sure you try these beforehand to ensure they don’t upset your stomach. You don’t want and unscheduled port a potty stops…… Good luck Sunday! Arthur Lydiard said “Don’t pull the plants up by the roots”. For the next 2 weeks leading to April 7 you should be tapering by reducing your workload a lot. Nothing you do over these next few days will help you gain better fitness. Don’t be tempted to test yourself, it will only break you down and impede recovery. Not tapering properly can negatively impact your performance on April 7. The key workout during the taper phase is a “up tempo” run of 800m – 1500m, to help you test your race pace rhythm. It’s preceded by a typical race warmup for you and a long slow cool down. Any other aerobic runs or jogs are done at the slowest end of the recommend pace as the goal is full recovery. These are not “junk” miles, a term I have heard thrown around. There is no such thing. A very slow run allows your muscles to fully recover from the harder workouts in the prior weeks. It is critical to do these properly as they aid the total recovery process. There are no workouts in taper which break the body down. It’s all about rest, recovery, eating properly, getting enough sleep and not drinking alcohol. There is a dehydrating property to alcohol which is the last thing you want to experience during taper or on race day. There’s plenty of time for the post-race celebratory beer after a job well done. Next week I’ll go over final week prep, diet thoughts and race strategy. For our runners following the Lydiard Method, the Taper phase is the last of 5 phases shown here leading to peaking on your target race day. (©Lydiard Foundation). As the runner proceeds through the phases the volume decreases and the pace increases. If you would like to learn more about the Lydiard Method, stop by the store as we enjoy talking about training, particularly yours! We’ll be happy to take you through the concepts for each phase. Our Lydiard Method training runners are now headed into the Taper phase after this week. Its two weeks long and culminates in target races April 7. The hard work is all done by this time and these two weeks are all about allowing your body to fully replenish and provide the opportunity to arrive at the starting line healthy and fit to do your best. I’m sure I’ll see runners trying to get their “20 milers” in two weeks out from race day or even 3 weeks out. Not Lydiard trained runners. What others don’t realize is at this stage the cake is “baked” and they don’t have enough time to even recover properly from these long runs, if they can’t finish them under 2:45. For Lydiard runners this work was done weeks ago at the appropriate time and duration. But that’s a TTT post for another time. First an update from this past Saturday, March 16. Running Niche had 7 Lydiard method athletes compete in the St. Pats Day 5 Miler here in St. Louis. This event was used to simulate race conditions and preparation while performing a Progress Calibration Run to gauge where they are in their fitness development. All 7 ran negative splits and finished strong, the core goal of a PCR. All but one PR’d. Here’s the results: Omar Abdi 3rd overall in PR of 25:28. Carolyn Baird 4th overall in PR 31:35. Nick Pelligrini PR’d in 35:36, Maria Fassett PR’d in 45:41, Angela Mazul PR’d in 46:52 and Sergio Masul PR’d in 46:38. David Mokone finished 19th overall in 28:44 after a break in training. My congrats to all for handling this “race” in a disciplined manner. They are starting to realize their strong fitness level, benefits of their training and what they are capable of in their target race in 3 weeks. We’ll be working with them to plan their race strategies soon and will post about the key pieces of that. Pictured here are Angela and Sergio. Back to the Lydiard phase 5, Taper. Over the last 2 weeks the workload is gradually decreased. There are no workouts which break the body down. Anything done fast is done short. Aerobic runs, although shorter, are a key component as they are in all Lydiard phases. Do be mindful of your diet during this phase as with decreased workload if you tend to overeat you will gain weight. However, in the three days prior to your target race, particularly for the marathon, eat plenty. You have to ensure your glycogen stores are maxed out. While you may feel sluggish in the first few miles of the race, you will lighten up later in the race and feel smoother. You will feel good, rested and want to do more during tapering. Resist this temptation. Doing less now is the key component of this phase! You should feel fully recharged and ready. With GO! races 3 weeks out now, Lydiard runners are allowed to run two more race situation time trials as final prep as they sharpen for their target race. Next week I’ll post about race strategy approaches. If you would like to learn more about the Lydiard Method, stop by the store as we enjoy talking about training, particularly yours! Many of our Lydiard Method training runners are now in Phase 4 which is called “Integration”. This phase is the bridge between anaerobic and peaking. Workouts within this phase are designed to simulate race conditions. Most of the hard work is done, and it’s time to start reaping the rewards, while keeping your target race top of mind. We had several runners jump into races on Sunday, either Quivering Quads or Creve Coeur Half Marathon. More on that in a few minutes. 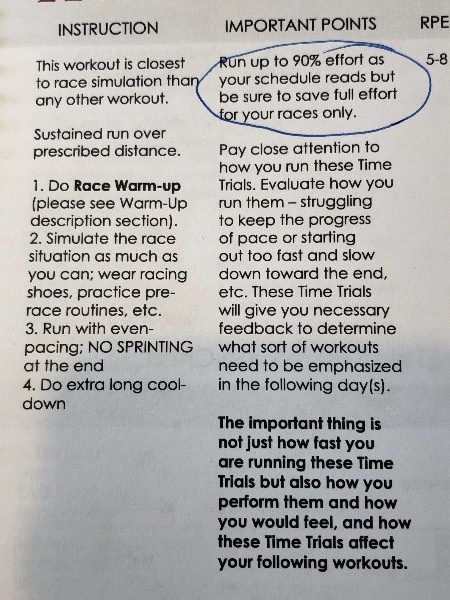 While they all have 4 weeks until their target race, Time Trials and/or Progress Calibration Runs (PCR) are a great time to practice pacing skills, simulate race conditions, get used to racing flats and try different fueling strategies. PCR’s are controlled steady state runs done at faster paces and designed to push the second half of the distance. The runner generally finds they are performing these faster than expected as their fitness level is more fine-tuned now as they head into the tapering phase. These are strong but not full out or even 90% efforts. PCR’s can be done in a race if the runner is disciplined and doesn’t get tempted to “race”. They should also always feel that when finished they could have continued on. Time trials are actually done at around 90% of racing effort. These are best done by actually entering races to fully experience the entire process from pre-race through to cool-down. Be sure your warmup and cooldown appropriately for time trials or PCR’s and under no circumstances should one sprint at the end as this increases the likelihood of injury. Save it for the real target race! Also, one important hint, do not start out too hard in a time trial, work your way into it. And keep at 90% or below effort. 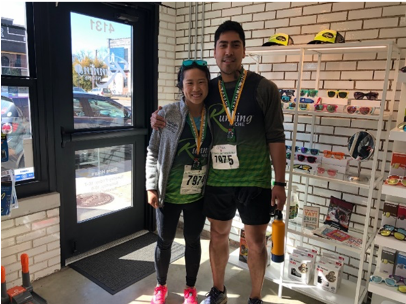 This past weekend we have two runners enter Quivering Quads. Both guys ran well, and their effort was well within their target pace range. They, as our other Lydiard runners, ran this on top of a couple harder workouts on Tuesday and Thursday prior at they are still in integration phase and not tapering yet. Chris finished 2nd overall and Tony placed 46th. Both excellent workouts, yes workouts, and part of the Integration phase process. At the Creve Coeur Half Marathon, Running Niche was well represented. Omar Abdi places 1st overall (personal best time), Michael Roy 11th overall (PR), Marie O’Leary 1st overall, Carolyn Baird 3rd overall (PR) and Jennifer Henderson 6th in her age group and well within her pace range for the workout. All these runners approached this as a workout and is part of the Lydiard training plan. When is the Right Time to Use Gels as Fuel? The body uses two sources for energy: carbohydrates and fats. While ingesting “gels” packed with carbs during aerobic training runs is popular, physiologically it doesn’t train your body to efficiently use its fat storage as the main energy source. Long distance running is aerobically based and aerobic exercise works best by utilizing the body’s fat reserves. As you can see by slide number one, Fat is very effective as the core fuel for aerobic exercise. Keep in mind the half and full marathons are 98% aerobic. The second slide shows how as one runs longer, the utilization of fat as the fuel becomes more and more important. The longer you go the more important fat utilization becomes as burning carbs is just a short-term energy pop. So, the question becomes what is the best way to train your body to maximize utilization of its fat storage during long aerobic runs? Its simple; don’t use gels or other form of carbs during your long training runs. If your body is burning these quick hit replacement carbs you are not training your body to efficiently metabolize your own fat storage. 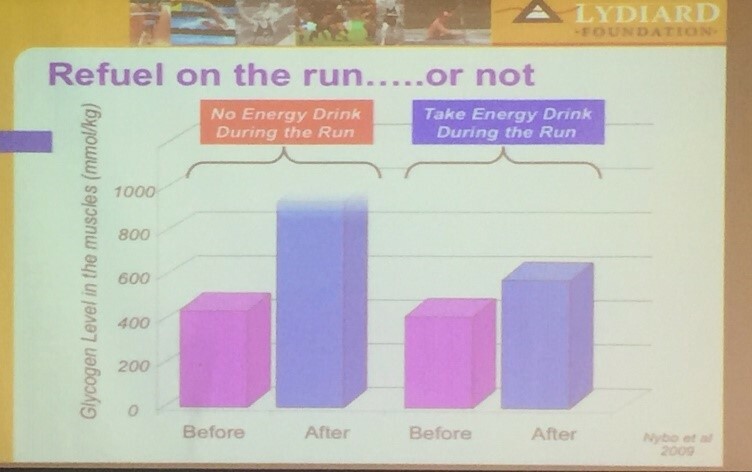 The final slide shows the glycogen levels in muscles while using and not using replacement drinks. When not used during aerobic training runs the glycogen levels at the cellular level are actually much higher than when replacements are used during training. You are training your body to become very efficient at burning fat as fuel for long aerobic runs. This is a science fact folks. If you are burning carbs you aren’t burning fat, its as simple as that. And fat is your primary fuel for the half and full marathon distances. Which brings me to the question of when should you fuel? With the GO! St. Louis races only 5 weeks away, and many Lydiard Method runners moving into Phase 4; Integration, now is the time to experiment with carb gels. If you have trained properly all your long aerobic runs up to now would have been accomplished without these replacements and you have built a well-oiled fat burning machine. As you jump into a couple of races leading up to GO! try several different kinds of gels to find the one that works best for you in terms of absorption and which does not upset your stomach. Given the quick acting nature of carbs, you will feel a “boost” which will come in quite handy particularly in the last 8 miles of a full marathon. In this way you are racing on a fat burning engine you have trained well over these past few months then primed at the right times later in the race with carb packed gels. This week’s training tip is quite simple. A couple thoughtful quotes from Master Coach Arthur Lydiard. As many runners on the Lydiard Method are now in the Anaerobic phase its important to keep this in perspective. Guts do play a role in these interval sessions. They are “uncomfortable”, by intent. You need to push yourself, get your body accustomed to being distressed a bit, not too much, but a bit. When you are doing the longer interval segments, which many of you are doing now, 1.25 – 2.0 miles, you need to persist, keep your pace consistent and be sure you are recovering between each. A good rule of thumb is when your heart rate drops back to 120-130 bpm. You will need to push to the level of “uncomfortable” but no further. The point isn’t to puke. “I have a saying, ‘train, don’t strain’. The Americans have a saying ‘no pain, no gain’ and that’s why they don’t have any distance running champions. They get down to the track with a stopwatch and flog their guts out thinking that will make them a champion, but they will never make a champion that way”. Remember that you are training, and in a specific training phase of the Lydiard Method preparing you for your target race in April or May. Every workout you do is built upon the prior and each phase builds on its one before. Keep the faith, your training will serve you well on race day.